Christmas: To Celebrate or not to Celebrate | WWAM Bam! Christmas. A difficult time of year. I tried to do Christmas when I was still at university in Beijing. As I was the only person in my household looking forward to the 25th, there was a significant lack of festive cheer in the air. The absence of Christmas lights sparkling through living room windows and the fact we had classes on Christmas day meant my excitement failed to build. However, I was determined to create the magic myself and enjoy a traditional Christmas. 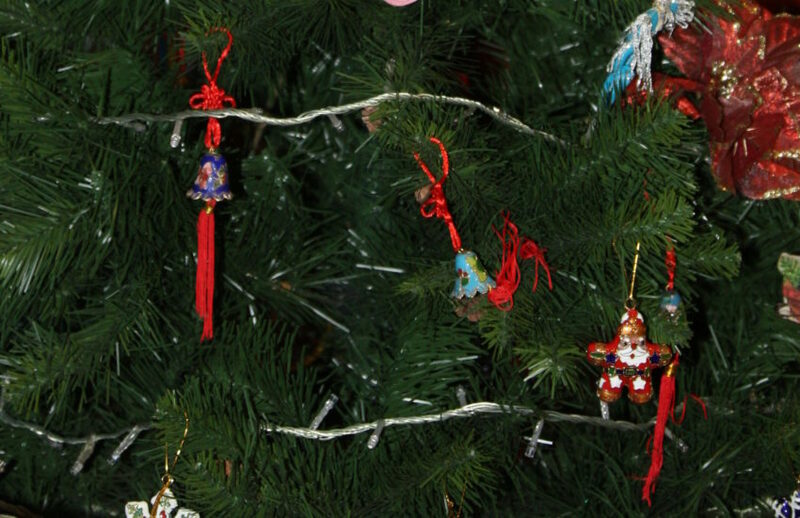 I bought an artificial tree in the flower market and decorated it with lights and Chinese good luck charms, more commonly found dangling from the rear view mirror of cars. I stuck cloves into oranges while my mother-in-law looked on in horror at the wasted spices and fruit. I made mulled wine even though I don’t like wine but I wanted my Chinese family to experience all the delights of Christmas. I made mince meat from scratch for mince pies and my mother-in-law used the left over mince meat in her bread making. While mixing all the ingredients for the pudding I even asked everyone to have a stir and make a wish like I had done every year since I was about two years old. On the 25th we made Christmas dinner with all the trimmings in our standard size toaster oven. Forget Delia Smith’s timings, with the extremely limited oven space the only food still hot by the time everything was cooked was the steamed broccoli and roasted potatoes. Everything else was cold: the Yorkshire puddings; the sausages wrapped in bacon, stuffing, the chicken (a turkey wouldn’t fit) etc. We soaked the Christmas pudding in brandy before setting alight with the lights dimmed. Crackers sent from home back in the UK accompanied our meal. Did I feel christmassy? No. Not in the slightest. I had set my goal to high and the sense of failure just led in an over riding feeling of disappointment. It was no one’s fault. My mother-in-law had helped me as much as she could with all the preparations but I just didn’t feel christmassy and I missed my family back home. Fast forward to the following year. The Christmas tree stayed in its box. The toaster oven was delighted to remain in retirement. The 25th this year was going to be a normal day in China for me and I would attend my classes at university. I woke up and everything was perfectly normal but my husband was fast asleep. I crept to our bedroom door, opened it and…wow! My initial reaction was HEALTH and SAFETY! We could have been trapped in a Christmas tree fire inferno! My next reaction was to tear up due to the surprise Christmas spirit that had suddenly overcome me. It was beautiful. During the middle of the night of Christmas eve, my husband had set up the tree, decorated it with lights, charms and several wrapped up gifts. Wanting to give me the biggest surprise he could, he had position the tree in our bedroom doorway and left the tree lights on all night before closing the door. That’s the health and safety aspect that has been drilled into me since childhood – never leave tree lights on in a sleeping house – and never leave tree lights on in a sleeping house blocking the only escape route! However, luckily our lights weren’t faulty and it was the most heart warming surprise. My mother-in-law, although it was Chinese food, had prepared a special dinner. This year, there was no disappointment. It was perfect. I had lowered my expectations to zero but my husband and my mother-in-law brought the spirit of Christmas into our home. What did I learn from these two experiences? Perhaps that it helps to accept that Christmas in China may be different but that doesn’t mean its impossible to find some festive cheer. Try to discover a Christmas that works for you and your family. If you only have a toaster oven, then it might be better to enjoy a less stressful meal that can be served at the right temperature. Where’s Wang: “Selfie” – Too on the Nose for InstaMillenials?